The streak is over. 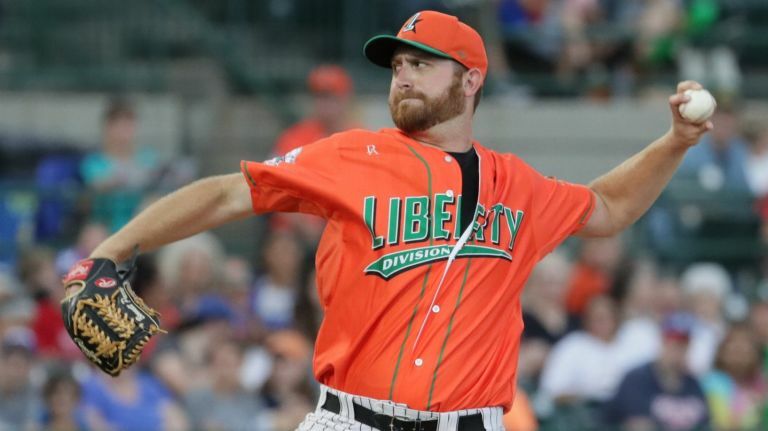 The Liberty Division won its first Atlantic League All-Star Game in eight years, 4-3, in walk off fashion in front of a sellout crowd of 6,414 at Bethpage Ballpark in Central Islip Wednesday night. Alfredo Rodriguez, who plays for the Somerset Patriots, smoked a single down the leftfield line with two outs in the ninth to drive in Gustavo Pierre. Rodriguez was named the MVP of the game. The night marked the third time the Ducks have hosted the independent baseball league’s version of the midsummer classic. They hosted in 2002 and 2010. Seven Ducks were selected to play in the game. Second baseman Jordany Valdespin, designated hitter Lew Ford, catcher Ramon Cabrera, and pitcher Bennett Parry all started. First baseman David Washington and pitchers Jake Fisher and Wander Perez all played. Julio Borbon of the Somerset Patriots staked the Liberty Division to an early lead, launching a solo home run with one out in the first inning. Parry, the Ducks ace, pitched a 1-2-3 first inning on two days’ rest and Somerset’s Cory Riordan set down the Freedom Division 1-2-3 in the second. But the Freedom Division woke up in the third, posting three runs off Jake Fisher. Fisher faced eight batters and yielded a two-run single to Frank Martinez of Southern Maryland. Darian Sandford of Lancaster scored on a groundout to give the Freedom Division a 3-1 lead. The Liberty Division scored two runs in the fifth to tie the score at 3. Consecutive doubles by Deibinson Romero of the New Britain Bees and Mike Fransoso of the Somerset Patriots cut the lead to 3-2 and an RBI single by Rodriguez, knotted the score. The Liberty Division wasted a chance to take the lead in the eighth when Rodriguez was caught steeling at third with no one out and Valdespin, the league’s best hitter, at the plate. Valdespin then walked and stole second, but Borbon struck out, Ford reached on catcher’s interference, and Washington struck out to end the threat. Before the game, Romero won the home run derby. He hit three home runs in the finals to beat Ford and Washington, who were both homerless in the championship session. Ford won the first round with three home runs. Romero hit all three finals homers consecutively.